Summary: One of the world’s great energy experts reports on the view from a energy conference in Qatar. Oil is the fountain of their prosperity, and they well understand how brief the Age of Oil will be. Reflections by Robert Hirsch on the Conference “Peak Oil: Challenges and Opportunities for the GCC Countries”. Held at Doha, Qatar on 2-4 April 2013. 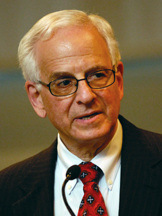 Robert Hirsch ran the US Fusion Program during the 1970′s, and went from there to become one of America’s top energy experts. Here is a brief biography. He was the lead author of one of the major papers about 21st century energy: “Peaking of World Production: Impacts, Mitigation, and Risk Management“ (aka “Mitigations”), commissioned by the Dept of Energy, published February 2005. Co-authors are the economists Roger Bezdek and Robert Wendling. They also wrote The Impending World Energy Mess: What It Is and What It Means to You (2010). From 29 November 2005. 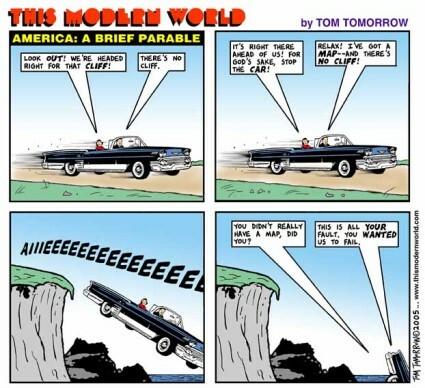 See Tom’s work at his website This Modern World. Previous Post Thatcher said that we have no alternatives. Progress requires that we prove her wrong. Many print media have folded. The ones that have survived simply took the “print” out of their mission statement and became media companies. The oil producing countries need to become energy countries. They could invest in coal-to-gas technology, biofuels, nuclear fission and fusion, electricity storage, and space propulsion systems. The classic explanation of what Mellor describes is in “Marketing Myopia” by Theodore Levitt, Harvard Business Review, July-August 1960. Every major industry was once a growth industry. But some that are now riding a wave of growth enthusiasm are very much in the shadow of decline. Others, which are thought of as seasoned growth industries, have actually stopped growing. In e very case the reason growth is threatened, slowed, or stopped is not because the market is saturated. It is because there has been a failure of management. The railroads did not stop growing because the need for passenger and freight transportation declined. That grew. The railroads are in trouble today not because the need was filled by others (cars, trucks, airplanes, even telephones), but because it was not filled by the railroads themselves. They let others take customers away from them because they assumed themselves to be in the railroad business rather than in the transportation business. The reason they defined their industry wrong was because they were railroad-oriented instead of transportation-oriented; they were product-oriented instead of customer-oriented. 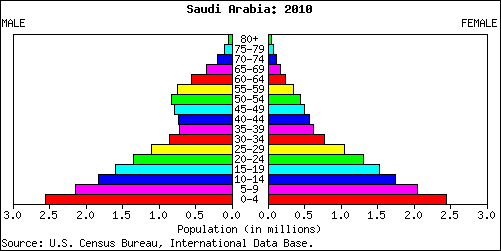 To see why they worry, look at the demographics of Saudi Arabia (from the NationMaster website). Aprox half of the population is under 20, 3/4 under 30. This is indeed a big concern for Saudi Arabia. As a notable example from this part of the world: When one conpares this with e.g. Iran (http://tfw.cachefly.net/snm/images/nm/pyramids/ir-2010.png) the picture looks quite different. 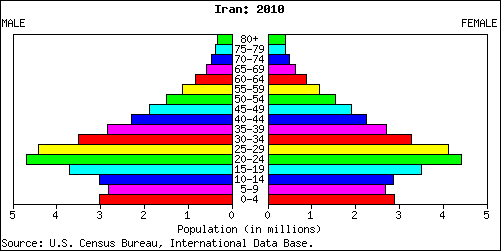 Iran is on its way towards a demographic transition, while Saudi Arabia (and also Yemen, and to a slightly lesser extent Egypt) is still far away from it. Mr Maximus, I’m really glad that you enabled comments on your site again. I feel that they add further depth and dimension to your already interesting takes. Topics here can sometimes be a little chewy, and can take many perspectives before swallowing. I know you try to limit the length of your articles to enhance readability, and I think that the comments section is a good way to have each post expand organically, while still allowing brevity for those who prefer it. No mention of climate change…as we extract more and more hydrocarbons, burn them and increase Greenhouse concentrations in the atmosphere, “peak oil’ will be an afterthought. On the contrary, climate change won’t be that bad because Peak Oil, closely followed by Peak Fossils, (in 2016 according to Energy Watch Group’s latest report) will crash our globalised industrial civilisation. Because that isn’t the case in the west ? How about the decades old denial represented by using the “Arab embargo” label for the first oil shock, when it was a direct consequence of US 1970 peak, and further to it, both western majors and US diplomacy were PUSHING for a price rise (necessary to start Alaska, GOM , North Sea). And the “energy crisis” started from the US peak. Do you know that from Saudi Arabia towars the US the “embargo” NEVER existed ? How many Americans today, know that the US went through its peak in 1970 ? In parallel a rebalance of each barrel revenues between majors and countries ? yes for sure. People should reread James Akins a bit more (and Walter J Levy). what is most puzzling of all is the gold-oil price correlation. Oil price is a good predictor of gold price. That’s not really true. Commodities have a high correlation with each other over long periods of time — and often over short periods as well. Monetary factors and economic growth are probably the major drivers. Within commodities the relationships are much less stable. Probably due to individual supply/demand factors for individual commodities, plus investment flows. Both are significant. (a) Since the 2008 crash, people have been buying gold to prepare for the falling US dollar and rising inflation. Both of those forecasts have proven decisively false during the past 5 years. As was predicted here at some length in 2008. (b) Since roughly 2004 many doomsters have forecast the onset of peak oil (and crash of civilization). These predictions have also proven false, as the combination of technology and high prices work their magic — bringing forth new supplies. This was extensively discussed here during 2007-2012.
afaict, peak oil happened back in 1970. It’s really “peak cheap oil”, after all. It seems silly to predict that it will happen in the future, rather than the past, when it actually happened. That is in the US. 95% of the world’s population doesn’t live in the US. “Peak Oil” means the peak of oil production rate, measured in millions of barrels per day or equivalent. It is NOTHING to do with how cheap it is. On the other hand, the great law of geology is the inverse relationship of ore quality and quantity. The lower the quality (broadly defined, including accessibility), the greater the quality. Increased technology in an offset to this process (e.g., lowering the cost of production, allowing exploitation of previously inaccessible. So we’ll never run out of any mineral. Peak oil refers to the treadmill (aka Red Queen effect) of increasing production of increasingly low quality ores. Eventually it become impossible to maintain production (in terms of net energy, not raw quantity — which becomes increasingly irreleant). The puzzle is why something that has no industrial use is behaving like an industrial commodity. And aren’t you contradicting your own post saying peak oil is nonsense and touting the magic of fracking and tar sands? There is nothing in Hirsch’s note saying anything even remotely like that. Please read more carefully. As for your first point: monetary factors and capital flows affect all commodities — indeed, they affect all asset prices. Robert Hirsch slides still point at around the same date and depletion rate as before though. Yes, but with recognition of the very large uncertainties involved. 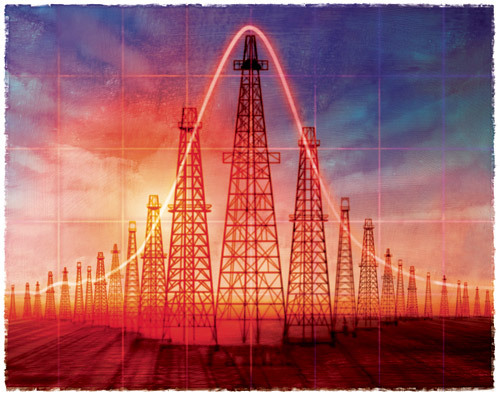 This distinguishes him from the main body of writers about peak oil, whose wild — often alarmist or even doomster — predictions have proven quite false. Not sure who you are referring too, and I would say Robert Hirsch projections taken at face value are highly alarmist as well (not a critique in anyway, more the contrary), especially if consider a needed 10 or 15 years preparation period as he has written, which is clearly not available anymore. That’s a great point — thank you for catching that. I meant that Hirsch understands the large uncertainties in the public data, and so avoided the “the end is near” screams which characterized so much of the writing about peak oil from 2003-2008, and which has discredited it to large fractions of the public and decision-makers. Look at the writings of the late Matthew Simmons — once an icon of PO writers. Now they read like a collection of urban legends (as I wrote at the time) mixed in with good sense. Matthew Simmons main message was that Saudi Arabia reserves were over estimated, and it is indeed most probably the case, with the internal OPEC political upticks of the eighties. As to the data, the over optimism of official agencies can now also be considered legendary, with the slides showing the declining optimism in the various world outlook taken year by year. For this I stick to what seems to be the best source and the most “hard data” oriented, which are the ones from Jean Laherrère (also the basis for the 98 en of cheap oil article). Otherwise to go back to Robert Hirsch current message, it seems to me that he has a bit “lost hope” about mitigation plans being set up at a national level (I mean in his slides, I think there might be quite a bit about that in his last books), and his advices are more personal “preppers” oriented in a way. Again not really a criticism, considering his 2005 report. – who knows today that the US oil peak was in 1970 in the broad public ? – the first oil shock(sudden price rise) still has the image of a geopolitic event, when it was really already a ressource constraints event, with US lower 48 crude peak and the need to start more expensive plays. Moreover current crisis isn’t even considered as an oil shock (when the barrel in constant $ is higher than highest second oil shock), when current crisis IS peak oil crisis, then you can judge its severity. Not to forget that current crisis is more considered as a “debt crisis”, and when did these debt started piling up in all OECD countries ? Precisely following the first oil shocks (and you could add dropping of Bretton Woods in 1971), and today’s all that covered with massive QE and the like. Or considering what is going on in countries like Egypt. Whatever Simmon’s “main message” was, his actual statements were often wrong. Sometimes wildly wrong. His book was published in 2005, and 8 years latter looks quite wrong. That he’s still cited as an expert so many writers about peak oil is yet more evidence of the disinterest in facts that has largely discredited the concept. Unfortunately, since it is coming. See the FM Reference page on the right side menu bar for more about this. Or search for Simmons. There is a wealth of documentation about all this on the FM website. I don’t care that much about Simmons, he was a banker, but an ok guy. The point is more that the US is in full QE mode, but volume based taxes on fossile fuels (in a pure national selfish interest sense), considering both CO2 and finite ressources aspects, aren’t even on the table. Volume based taxes not to increase gov budget, some can be removed on work in parallel, but to accelerate any possible transition, without even having to define “solutions”. Meanwhile the first oil shock is still called the “Arab embargo”. If prediction of high inflation is wrong, then prediction of deflation is even worse. Deflation is nowhere to be seen in US and Europe. Even Greece has no deflation. Only Japan registered a mild deflation of 0.7%. Not quite. We were experienceing debt deflation, a precursor. It was prevented by global fiscal and monetary stimulus on a scale never before seen, and which continues to this day. That this has produced so little inflation despite these programs shows the force of the deflationary impulses. Another mode of evidence would be to shut down these programs, and allow the western world to collapse. In October 2008 — as this fire was breaking out — I gave excerpts from a 2005 BIS paper that explained all this quite clearly. Click here to read it. Here are other posts about debt-deflation. The economy is on a knife-edge. If the Fed doesn’t print enough money producing exactly the right amount of economic stimulus, then there will be a deflationary spiral. If they feed too much money in, there will be a hyper-inflationary spiral. So far they have managed to keep everything on the knife-edge – I’m amazed at how well they have done. But it can’t go on forever, simply because they are not all-seeing and all-knowing. In practice, loans taken out for productive projects (making widgets) take months, if not years, to bring to market and no one really knows how many people will still have a job then, or whether they will buy widgets or iPads. So even the latest data is out of date when the Fed have to decide how much stimulus is required, and sooner or later they will get it wrong. Helicopter Ben insists deflation is instant, and inflation is slow and allows room for further manoeuvres, so hyperinflation is probably the side of the knife-blade that we will fall. And all the time energy is getting harder to produce, and therefore more expensive, and business models for sensible productive projects get fewer and fewer. Hilarious, these guys are always about 20 years behind reality. They get around to accepting peak oil right about the time that the issue has been superceded by non-conventional petro production. The game has changed, maybe the new Tamar field in their backyard will wake them up. 1) From all the reports I can find, Tamar appears to be a gas field, not oil. 2) Tamar will solve Israel’s natural gas problem for a couple of decades, but adds a small % to global reserves. 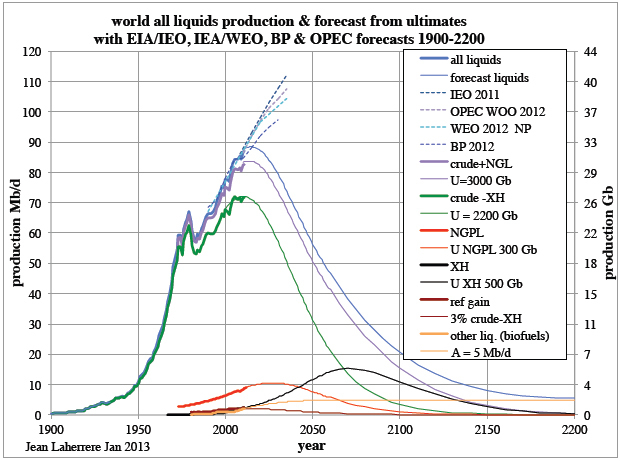 Peak Oil (and Peak Gas) do not discount that new such discoveries will be made. Let us know when new discoveries reach 100,000,000,000 cubic meters, then we’ll talk. 3) All data points to a decline in new discoveries of oil (and gas) and an inability of world production to exceed 90 Mb/day, ever. I am so glad you are on some kind of vacation, drinking binge or just massive writers block. The world is a better place FM since you have not posted anything of relevance since April 11th…oh wait, you have posted anything at all since April 11th. I would love to have this drivel about peak oil be your final post. Please dont answer me, I am on vacation now.